After missing out on last year’s convention because my assistant decided getting paid for actual work instead of doing free convention wanderings was a better deal… well, I made a return to my convention fun. With a new assistant. Who ended up having more delightful shenanigans than I, but more on that later. 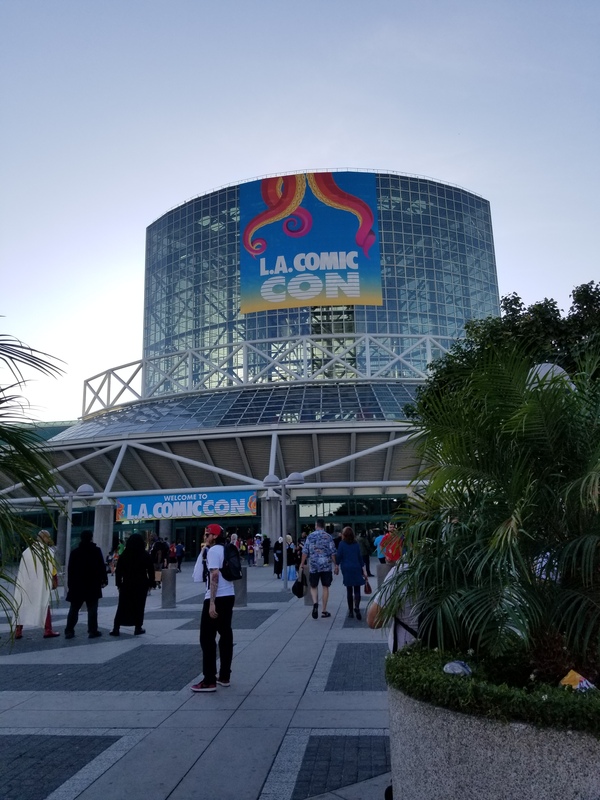 One thing I have always enjoyed about Los Angeles Comic Con (formerly Stan Lee’s Komikaze Expo) is that as it has grown, it has done so in an arithmetic manner- meaning that it’s gotten bigger but it has done so without getting too big for its britches. However, I do still find fault with the spacing in the main room. And the main stage… That has never worked for me as a space to see a panel with a special guest because it is too loud and you can’t sit and enjoy anything. I also enjoy that generally there is a wide range of guests. The usual grouping of wrestlers and Power Rangers, of course, but also a large number of voice actors and co-stars from strong TV shows, pop up in attendance. This year we stumbled upon the charming John Glover as we were wandering the hall. My assistant this year was Barbara (you may recognize the name from a recent series of guest posts, or as my mother) and she has not seriously attended a convention in probably 30 years. So as we wandered, I pointed things out and we discussed costumes/art/etc. And boom! as we walked across the wide center aisle, there sat John Glover (whom we both know and loved as “Lionel Luthor” on Smallville). Well, at the time, no one was talking to him and so we maneuvered over to say hello. Which led to the two of them discussing the theatre they had grown up loving, and how he thinks a lovely way to go would be to die on stage, “with my boots on”. This man is a delight and just a lovely guest to speak with. Not to mention the adorable smooch photo(s) I have of him planting one on mom’s cheek. Or the fact she got to run her hands through his hair. I have not laughed so hard in a while. It was a wonderful convention experience. And now I can also say that I’ve met and chatted with two of the dads from Smallville. That’s a win, right there, ladies and gentlemen. We had a few complaints- as we always do. Too few waste baskets- thus you ended up holding trash for way too long. Just an annoyance (but one mom insisted needed to be mentioned). Also, the aisles… I swear I am going to start teaching a class about how to walk down a convention aisle. People are so dumb about this- it’s a simple thing, if you want to look at something step to the side, out of the way; if you want to take a picture, get out of the walking area to do so; and if there’s a damn stroller or wheelchair around, look down and see them instead of just pushing through and effectively tripping over them (I have always tried to be conscious of them, but this year I was pushing one and saw sooooo many people ignore it)(also, happily, had many people who stepped out of the way or who were at least clearly paying attention to their surroundings). And walk on the R side of the aisle! They teach that in kindergarten. Sheesh. I know, I’m bitching but seriously… it was damn hard to get through in some places. 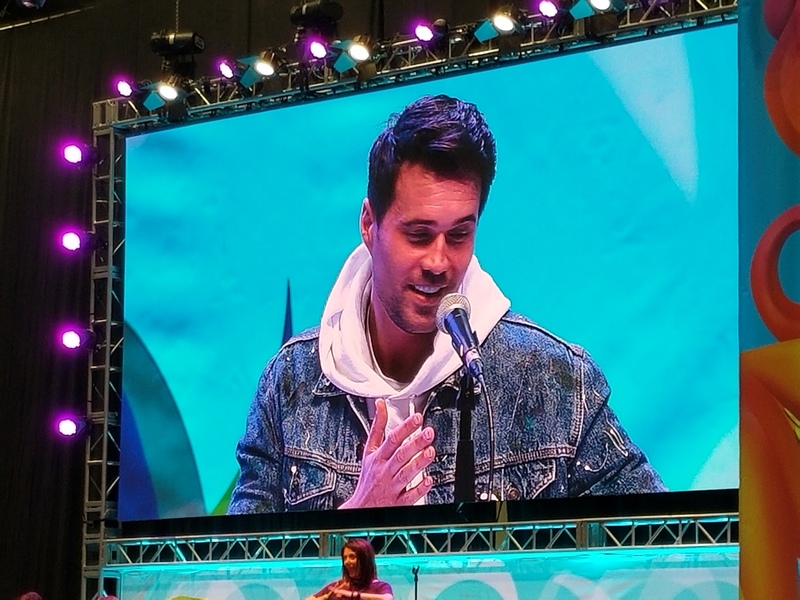 We briefly checked out the Agents of SHIELD (er… Hydra) panel with Brett Dalton. Charming, S.O.B., that one. But I am not a fan of standing in crowds, especially when I am trying to enjoy a panel, so we didn’t stay for the whole thing. I want to touch on a lack of communication that happened this year. For me, it started with the program materials. Normally, we get a book with details about panels and events. This year it was a 1 page brochure type that had no information about anything. Meaning that in order to find out about any of the panels, you had to use the app or go to the convention website. Well, unless you were out in the entry hall or an exhibitor, there was cruddy internet available; and if I was out there, then I was probably thinking about leaving. There were a few panels that had interesting titles on the handout but by the time I was able to read the actual program guide (which seemed to default back to the beginning every time you finished looking at a specific panel), I was annoyed and just skipped it. As a former panelist at this convention, that made me sad because I know that I missed out a few good ones- but it was so annoying to not just be able to flip through a book. I know, I know, save the planet reduce waste, blah blah blah, but I have the program from every major convention I have ever attended. I left this one in the trash in my hotel room. This next piece regarding communication did not happen to me, but I was told about it and thus wanted to share my frustrations with it. Apparently, it was extremely difficult and slow going to get responses from the convention. A peer running a panel had a difficult time getting emails returned, questions answered, and became so frustrated that he said he won’t return to the convention, even as a fan. I have a problem with this because I remember when the convention was first starting, I had a question regarding guests and had a response from a VP in under 24 hours. I understand that it has grown, and it’s not being run by the same company now, but to blow off loyal participants in such a way that they are planning not to return… that’s bad for business. I was annoyed by poor communication the last time I attended, too- I had wanted to see Dominic Purcell but the information about when and where he would be changed and no one updated the social media or responded to queries. So following the program guide, we showed up when and where he was supposed to be only to find he was elsewhere and by the time we got there, he had left. So basically, I am just disappointed with how the new company does their correspondence. As with all conventions lately, the cosplays have been amazing. My personal favorites were probably the Labyrinth ones, but I’m partial to that film. I also enjoyed several Black Panther costumes and the variety of Wonder Woman and Star Wars. As I mentioned it had been some years since Barbara had been in attendance, so she really enjoyed seeing how the cosplayers have improved and the sheer variety of costumes. Overall, I was glad to have been able to come back to the convention. It was great to see some friends and meet online ones in real life (looking at you, Bonnie!). But I’m not sure it was worth the drive and costs for the hotel. But this is just my experience. I’d love to hear from some others who were in attendance. ← DC Recap Round-Up 2, Week 5: Let’s Check In On Some Titans!